It’s officially graduation season and, well, you’re already out of gift ideas. Take a look below and we’ll solve your grad gift dilemma in under 2 minutes. There’s nothing worse than a lame graduation gift. Anything that says “Glad to Be Grad” on it should really be tossed into a hole and buried forever. Nobody wants that, well, except balloons. In a world where students pretty much already have everything that they want it can be super tough to figure out something meaningful that they’ll not only love, but actually use as well. Whether you’re shopping for a recent high school graduate or the college graduate we’ve come up with a bunch of gift ideas that range from the traditional, inspirational, useful, and actually fun. It’s time to think differently, get creative, grab your gift, and just move on. Check out our picks for some of the best gifts for graduation (so far) in 2019. Because it’s great way for them to stay inspired even after graduation. 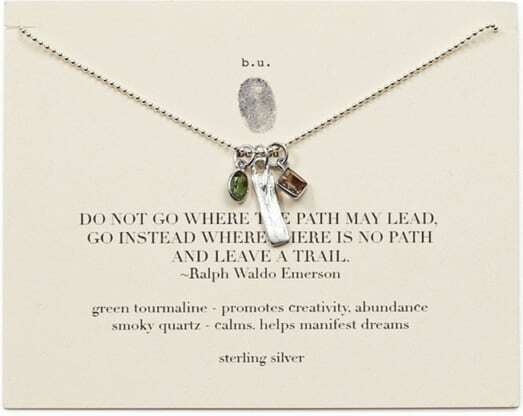 This sterling silver necklace is symbolic of the Ralph Waldo Emerson quote “Do not go where the path my lead. Go instead where there is not path and leave a trail.” Important words to live by. Because whether it’s their high school graduation and they’re heading off to college or they’re just moving out the odds are that they’re going to be homesick. This ‘homesick’ candle smells great and you can choose the state you want placed on the candle itself. It’ll help keep them calm and remind them of you and their home. Because your recent graduate will love that the latest from Amazon can fit pretty much anywhere in their dorm or apartment and you’ll love that you can have face-to-face calls with them! Oh, they’ll also get to watch video flash briefings, see music lyrics, weather forecasts, recipes, shopping lists, and way more! Because they may still seem young to you, but they’ve already lived quite the life and should really start documenting it. They’ll love looking back years down road and seeing just how far they’ve come. Yes, life can be totally stressful and sometimes we all need a little help with our anxiety levels, especially after we’re done with school! Everyone has been buzzing about the power of weighted blankets helping to reduce anxiety and, well, this is one of the best sellers of the year! It currently has 4.5 out of 5 stars on Amazon and over 2,800 customer reviews. You can even choose the weight of the blanket (anywhere from 7-pounds to 20-pounds). It also comes in a bunch of different colors and prints too. See all color options here! Because she still needs that motivating kick every now and then. This block wall art will look prefect in her new dorm room, apartment, or anywhere really. This idea is so cool. These are classes they’ll actually want to take online! Now they can take an online ‘Master Class’ with an actual expert! Even better, you can quickly and easily gift them this! Choose from over 45 different classes (and experts) based on her interests. Check out a cooking course from Gordon Ramsay, James Patterson teaches writing, Steve Martin teaches comedy, and so much more. Learn more here! Because they still want to look dope AF when heading to their next set of classes This one is super affordably priced too. Because everyone should want to shatter that glass ceiling this year once and for all. It’s a great reminder to keep at it, work hard, and strive for total equality. Now you can hit all the notes in the shower (or bathtub) thanks to this waterproof wireless speaker! It even has a built-in mic so thanks to bluetooth you can take calls from just about anywhere (luckily there’s not a camera built in!). See all the color options here! Because they can now pop their own popcorn right in their microwave any time they want, which makes it somewhat healthy. Score! However, if they’re throwing health out the window (good for them!) this one also comes with an optional butter melter right on top. Mmmm butter! Because they’ll love getting something new delivered to them each and every month. Depending on your selection they’ll either get the latest beauty products to try for girls or the latest grooming and skincare stuff for guys. A real win-win month after month. Because, let’s be honest, they could use the comfiest bedding set whether they’re moving into the dorm or into their own place. This set comes with the duvet and two pillow shams! We love it in this light blue, but it also comes in a bunch of other amazing colors like classic white, sand, light grey, slate, and the new blush color. See more color options here! Whether they’ve recently graduated high school or college, they could use a little zen time in their life. This year it’s all about the essential oil diffusers to help stay calm and, hopefully, anxiety free. This one is, not only, one of the best-sellers on Amazon, but it currently has over 30,000 customer reviews and has been rated 4.4 out of 4 stars! See more color options here! Because now they can take their best selfies ever. This iPhone case lights up with LED lighting so you always look your best and, yes, it’s for the latest and greatest iPhone X series. We love this one in white mirage jewel tone, but it also comes in other colors and styles like black, rose, rose mirror, white marble, lavender, desert flower, and more. See more color options here! Because now they can binge watch all those shows they’ve been talking to you about instead of, you know, actually heading to class. Fine, on the weekends. This is the latest and greatest and, yes, it’s the 4K version with Alexa voice remote! It’s officially time to upgrade their mattress and now you can do it relatively inexpensive and have it shipped right to their new apartment or, you know, your house if they’re moving back in! This one is one of the best-selling mattresses-in-a-box online right now and they have a bunch of different options that over 18,000 (and counting) people have reviewed! Read a more in-depth mattress review here! Because if they’re now going to have to cook for themselves after graduation they could probably use a little help. They can choose from what type of food they like to eat and how often you want your food box delivered (3 days, 4 days, or 5 days). All the ingredients show up in this perfectly packed box and stay at the perfect temperature until you’re home to store things in your refrigerator. Because they should be listening to their favorite tunes on something else besides their phone. Plus, this is the perfect party companion. This portable wireless speaker provides 360-degree coverage, is water resistant, and can wirelessly play up to 16-hours of music on a full charge. Happy graduation party! That’s right, this crossbody bag was recently chosen as one of Oprah’s Favorite Things and we can see why since it’s sleek, compact, and can still hold things like your phone, money, lipstick, bank cards, and more! We love it in the new light blue and white option, but it currently comes in other colors and designs like black, floral, pastel pink, white, royal blue and more. See more color options here! It’s the latest and greatest iPad of the year! This ‘Pro’ version has up to 10 hours of battery life on a full charge, is 12.9-inch edge-to-edge Liquid Retina display with ProMotion, True Tone, and even Face ID. Learn more here! We love this one because, uh, Dyson! But also because it helps to purify your air all year round. It keeps your room cool in the summer and warm in the winter, and even works with Amazon Alexa. Of course! Plus, it helps to remove 99.97% of all the allergens in the air. See more color options here! Because, yes, they’re going to need a ton of coffee and, well at all hours of the day and night! This is the smartest coffee mug we’ve ever seen! It has temperature control that they can choose to control remotely and even choose their own LED color! This one was designed to keep your beverages hot (hello coffee or tea!) from about an hour. You can even have different temperatures pre-set so different drinks can stay hot (or warm) at different temperatures. See color options here! Just in case they don’t already have Amazon Prime (what are they thinking?! ), you can now gift it directly to them! Choose from either a 3 month subscription or a 12 month subscription where they can now get free 2-day shipping on over 100 million products (yes, really). Learn more here. What Exactly Should You Get Him This Season? Great Ideas He’ll Love! The New Toy Everyone is Buzzing About!